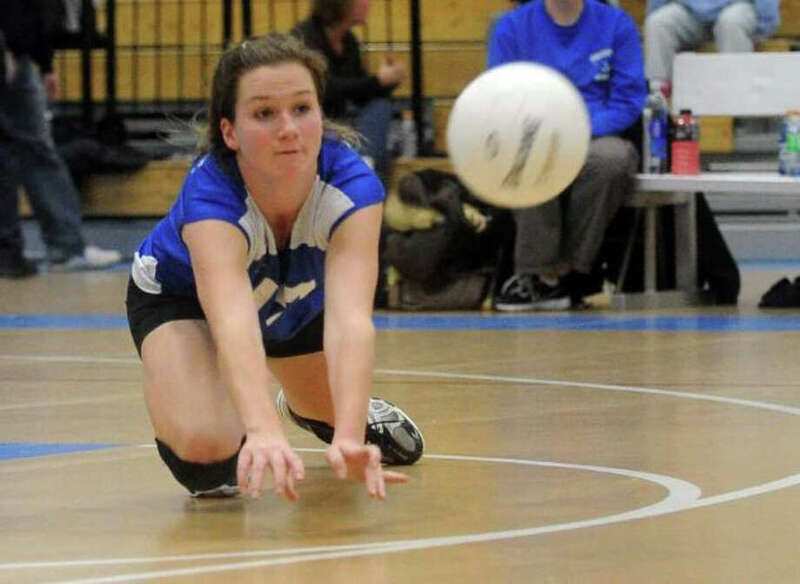 Fairfield Ludlowe's Emily Nelson is one of the few returning varsity starters for the Falcons' girls volleyball team. A year after losing six seniors to graduation, including the state player of the year, most coaches would worry about the talent he or she has. But Fairfield Ludlowe girls volleyball coach Meghan Skelton isn't a worrier. "If I worry, it resonates with the girls," she said. She realizes that the squad that finished runner-up in the FCIAC and Class LL in 2010 will look completely different than what she is used to in 2011. Losing Connecticut state volleyball player of the year, Maddi McCaffery, as well as four-year players Brandi Segala, Ashley Curtis and Heather Wamser makes for a different visual for Skelton. "I look around, and I wonder `where are all of them?'" she said. "It doesn't feel right." But that doesn't mean the Falcons won't be talented yet again. Skelton may not have as much varsity experience on the floor at any given time, nor will the Falcons be accustomed to playing with each other, but she is confident that as the season goes on, all that will come. "I worry about their mindset," she said. "We believe in them, and we want them to believe they're a great team. Once they do that, they'll be good." Skelton is content that the belief can be manufactured too. "The motto we're going by is `fake it `til you make it,'" she said. "We don't want them to doubt themselves." The 2011 team will consist of mostly juniors. Claire Wiggin is one of the few returning seniors. Juniors Emily Nelson and Jaime Quinn will be the Falcons' captains, and two of the team's returners. Juniors Kelly Rotondo and Jenn Elaesser are each returners to varsity as well, although neither such significant action. Rotondo will have the added pressure of switching from a setter to the team's libero. Ludlowe will welcome Lauren Schreiber to the team as a transfer from Georgia. All the talent the Falcons have makes Skelton grateful for how far they've come in the seven years she's served as the program's leader. "I was walking the halls looking for girls to join the team who looked athletic," she said. "I had to teach them how to serve and what rotations were." Despite Skelton's confidence, the lack of experience make her expectations slightly lower this year. "We have to start smaller this year," she said. "The goal is always the FCIAC and state championship, but most of these girls have never seen a varsity court before." And if those goals aren't met this year? "I have almost the entire team coming back next year," Skelton said.